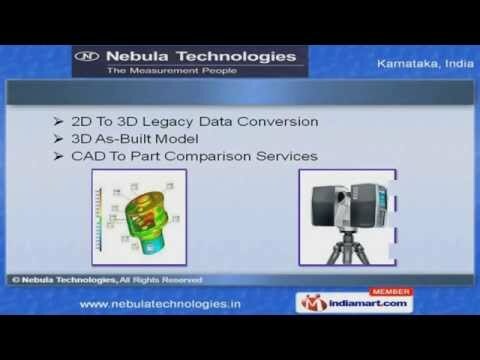 Welcome to Nebula TechnologiesService Provider of Design Engineering ServicesThe company was incorporated in 2005, at Bengaluru. Our Technically sound infrastructure &Client-centric approach help us to cater Indian Subcontinent. Industry leading prices, Advanced technical support & on time delivery are the striking featuresof our organization. Case Studies, Design Engineering, Measurement and Validations are the services that we offer. Our Design Engineering Services are a class apart. We offer 3D As-Built Model, 2D to 3D Legacy Data Conversion & CAD to Part ComparisonServices. Measurement & Validations offered by us are best in the industry. Along with that we offer Case Studies that are nothing but the best solution for all your needs. 3D Laser Scanner, Class A Surface, Machine Vision & Inspections are available at marketleading prices.